Did you know that North Carolina was the first state to have a gold rush? Oh yes, that’s right. Gold was found here in 1799. In fact, between 1804 and 1828, North Carolina remained the only producer of domestic gold in the country, and the state remained the highest producer (even after gold was discovered in Georgia) until 1848, when gold was discovered in California. The North Carolina Gold Festival is an annual event celebrating our area’s golden history and features exhibits, gold mining techniques and demonstrations. Visitors can take part in treasure and scavenger hunts, geocaching and gold panning. Additionally, numerous vendors will showcase their arts and crafts at the Festival. Entertainment on Friday includes “Gold Tales” and a gospel concert at 6:00 p.m. with Purpose, The Blairs and Glory Land Way Quartet and local bands. Saturday musical acts include The Can’t Hardly Play Boys, and the return of Nashville recording artist Juleigh Ed. The NC Gold Festival takes place May 15-16 at Tom Johnson’s Rally Park in Marion. For more information, visit www.ncgold.org or call 800-959-9033. The honey bee makes it possible for North Carolinians to enjoy over $200 million in produce annually. The McDowell Arts Council Association (MACA) will host the 1st Annual Honey Bee Arts and Crafts Festival, a free event taking place on the McDowell County Courthouse lawn on May 16, from 10am to 4pm. MACA has partnered with the McDowell County Beekeepers’ Association to celebrate the state’s official insect and the great food and art created with honey and bees wax! Demonstrations and bee-related products will be offered for sale. Arts and craft vendors include potters, photographers, woodworkers, handmade soaps, jewelry makers and more. Bring the children to the Kids Korner where they’ll be able to create their own masterpieces. The Chris Blair Band, Freddy Bradburn and Ruth Wakefield will provide musical entertainment throughout the day and there will also be a Little Honey Bee Talent Contest. Food includes Tagi BBQ, funnel cakes, ice cream and more, plus you can enjoy lunch at Bruce’s Fabulous Foods or Carolina Chocolatiers on Main Street. 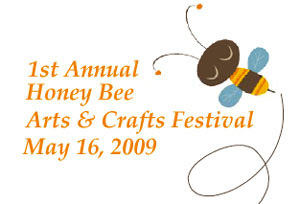 For more details on the Honey Bee Arts and Crafts Festival, please call the McDowell Arts Council Association at 828-652-8610.